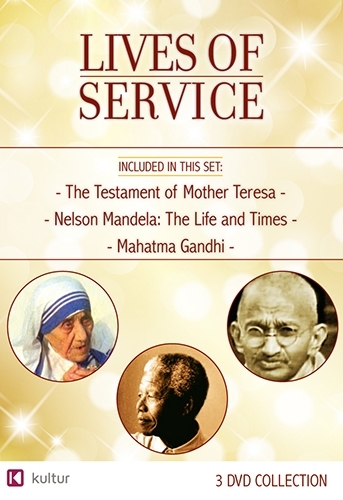 Although biographies appear regularly, the world actually knows very little about Mother Teresa. Apart from a few published speeches and selected prayers, she has not bequeathed any writings. This historic interview, filmed just months before Mother Teresa’s death, contains her thoughts and views on many important subjects and may well be regarded as the spiritual testament of one of the most exceptional women of our time. Nelson Mandela: The Life and Times is replete with the adventure, mishap, fortune and inexhaustible resolve of a truly historic life. This captivating biography chooses from the many truly extraordinary intimate epiphanies of Mandela's life', including the silent walk with his mother to the Royal Kraal as a nine-year old…or the fiery end to his first marriage…the ice-cream counter decision to face the death penalty. Mahatma Gandhi tells the story of the man whose belief in civil disobedience and passive resistance served as an inspiration for future struggles in the cause of civil rights and freedom. Gandhi was a major political and spiritual leader in India’s fight for independence in the mid-20th Century.